Writers can spend a lifetime looking for their muse. That inspiration, which makes them want to get up and put pen to paper or fingers to keyboard. I’m lucky in that I’ve never had that problem. My biggest issue is being focused. I can sit and crank out short stories all day and all night, the challenge: being able to string together enough consecutive hours for it to make a difference. A wise friend of mine pointed out that although they felt my passion for writing, that there was something else there that I was missing: having a dog. She was right of course and after some symbolic resistance, I went hunting. It had to be a special dog. One like no other. Smart. Energetic. Lots of mileage left to go. It also had to be a rescue dog. The last point was an important one for me, given the number of dogs abandoned every year. I found the dog, went to an event where he was showing and met him. His foster parents couldn’t have been nicer and the dog was ideal. He sat their letting his foster mom’s 2 year old pulling on his ears and trying to ride him like a horse, all the while smiling through it all. That would have made for a great ending… if it really ended there. Unfortunately, the dog in question had a lot of energy, and while it seemed like a good idea at first, it would not have been fair to take him in, given how much I work. I needed a dog that was more “broken in” and had “less needs.” Fair enough. That’s when he showed up: Fifty pounds of the sorriest dog that you’ll ever meet. He would only look at you if he was sure that he couldn’t be caught doing it. Would only take a treat long enough to put it on the ground. And didn’t want to be there. “That’s the dog for you,” proclaimed the volunteer. 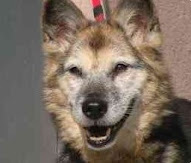 He wasn’t five or six, that was for sure, but he was obedient, and he had been in the shelter for several months. Whatever reason I had for not taking this dog in went out the window when I heard that. Several months in the pound and who knows how many on the road. Not a lick of interest in him and no one to come claim him. My mind was made up. It doesn’t matter if you run away from home or just get lost, everyone deserves to have someone looking for them. I took him in that day. I’m not sure when he took me in. It certainly was not on Day 1 when he tried to scale the iron fence on my porch. I don’t think it was after the three month mark when he started getting comfortable about being in the same room with me enough to sleep. Through it all, I know that when we get in, he knows where I’m most likely to be writing that day and takes up a comfortable position just out of reach to watch, or on those days when the world has taken a bit more than I could give he’ll come over and get in my face and give me that silly grin of his that he found again to let me know what really matters. * Yes, I thought they were “great” at the time. Some still have promise after the first couple of drafts. Epilogue (2011): That was Boo Boo. When I came home without a job one day and sat down on the floor trying to figure it all out, he was right there initiating snuggling for the first time. Three and a half years was exactly the right amount time to have together and when I think of him now it's of the spunky little guy who used to cheat by cutting across the field when we raced home, only to stop and catch site as the rabbits scattered away. It didn't matter that he couldn't catch them, his silly grin told me that he had caught everything that he wanted. And so did I.